Recently, the Board announced a listing of our upcoming summer events beginning with “Spring into Summer: an Evening at the Conanicut Yacht Club.” This is the first kick-off event to the summer season and will be held at 6:00 p.m. on Saturday, May 20th at the CYC. 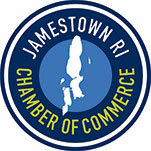 The Chamber will be hosting a buffet dinner and dancing (DJ). A cash bar and 50/50 raffle will also be available. Please R.S.V.P. by Tuesday, May 16 to Monique at monique@jamestownrichamber.com $35 per person or $60 per couple. We hope to see you at our upcoming summer events and please stay tuned for an exciting announcement regarding our end of summer party!